Jan 25, 2019 | What Am I Reading? 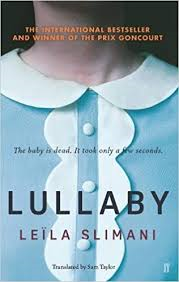 Lullaby (Faber & Faber Books 2018) is a slim novel originally in French by author Leila Slimani and translated by Sam Taylor. This engrossing story won France’s most prestigious literary prize, the Prix Goncourt. In deceptively simple but beautiful and lyrical language, this unsettling story opens with the traumatic death of two children at the hands of their nanny, and unravels backwards, taking us inside her mind and showing us the developing madness that leads to the crime. Louise is the perfect nanny: neat, tidy, quiet, devoted and polite. Myriam, due to return to her work as a lawyer, and her husband Paul, a musician, cannot believe their luck when they find Louise. She is the answer to their prayers. She cleans and cooks and mends, their children Mila and Adam adore her, and she is soon indispensable to the running of the household. Other parents envy Myriam and Paul for discovering her. She accompanies them on holiday and is available day and night to accommodate their every need. She never complains. She plans elaborate children’s birthday parties and tends to the children when they are sick. But as the couple become more dependant on Louise, and as she becomes more entangled in their lives, resentment, jealousy and suspicions begin to surface. Other aspects of Louise’s life come into focus: her dead husband, her absent daughter, her previous employers, her wary landlord. As the book delves deeper into her interior life it raises questions about poverty, class, domesticity, power and motherhood. From the chilling opening sentences: ‘The baby is dead. It took only a few seconds. The doctor said he didn’t suffer’ until the disturbing final scene, this book will hold you in a suspenseful trance as it dissects not only what has happened, but why.